This grainy image shows one of the few Javan rhinos to have been held in captivity. 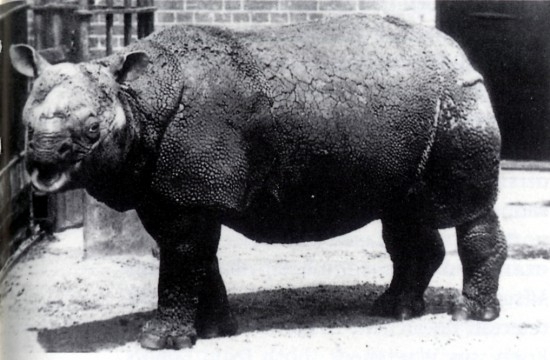 After capture in Jakarta, the rhino lived at the London Zoo from March 1874 until January 1885. Armed with hi-tech camera gear and a healthy dose of determination, award-winning photographer Stephen Belcher aims to spend three months in the severely challenging mugginess of Ujung Kulon National Park to capture the world's first high-quality images of these rare mammals. It won't be an easy project. Javan rhino terrain is a dense, swampy jungle. There are no clearly cut trails and a GPS will be about as much help as a hairdryer. A basic map and a couple of rangers to lead the way are all that Belcher will have to navigate the unforgiving landscape. Then there's the financial hurdle. Camera equipment, park fees, food supplies ... Belcher's budget for the trip is a hefty $55,000 NZD ($47,000 USD) which he hopes to raise through a Kickstarter campaign ending on June 5. "Logistically it's huge. And that's why there's a big cost," Belcher tells us. "The camera trap systems themselves are expensive. It's not just the camera with a lens on the front, there's a lot of parts that go with this … infrared systems, detection systems … and then it's the logistics of bringing everything in and out at Indonesia's inflated price." Unlike their African relatives, very few people are familiar with the Javan rhino species. At home in dense, jungle habitats, these animals are rarely seen, and with populations dwindling, they are practically off the radar. "It's not like in Africa where there's a good chance you'll see a couple of rhinos running around," Belcher explains. "In Asia it's completely the opposite." Researchers estimate that there may be as few as 35 Javan rhinos left in the wild and there are currently none in captivity. They are one of the rarest mammals on the planet. Deforestation and poaching are the main culprits responsible for the decline in numbers, restricting these rhinos to a tiny range on the Javan peninsula. To make matters worse, the elusive animals have picked a pretty dangerous spot to call home. Only 30 miles from the notorious, and currently active volcano, Krakatoa, one eruption could easily wipe the entire species off the planet. Belcher hopes that his high-quality photos will help spread awareness about an animal that few people even know exists. "Most of the stuff you get on an image Google search [for Javan rhinos] are actually misidentified Indian rhino photos," Belcher explains. 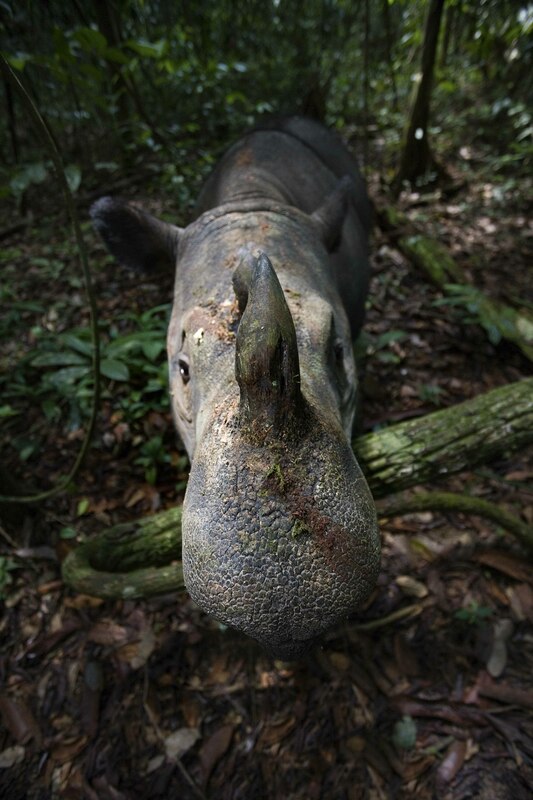 Through photographic exhibitions and the sale of fine art prints, the goal is to get the Javan rhino on the map before it's too late, and to replace the grainy or misrepresented photos with something that does this unique species a bit more justice. Various rewards are on offer for those who wish to contribute to the Kickstarter campaign. Click here if you're interested in supporting the project. We're getting on board and doing our bit to help the campaign by donating $1 USD for every share or retweet of the posts below. So share if you care! Ending the rhino-poaching pandemic starts with arming ourselves with some cold, hard facts. And when it comes to facts, infographics do it best.